It was a widely-circulated joke that, one day, no matter what was said, it could be immediately followed up by the phrase “there's an app for that.” Want to know the mating habits of lizards? There's an app for that. Replacing the question part of that exchange generated its share of hilarity, but reality managed to keep pace with comedy, leading us to today. Today, we have new reports of an app that will allow users to follow the Australian property market from an Apple Watch. Though the Apple Watch is still said to be over a month away from actually launching in Australia proper, app designers are clearly letting no moss grow. 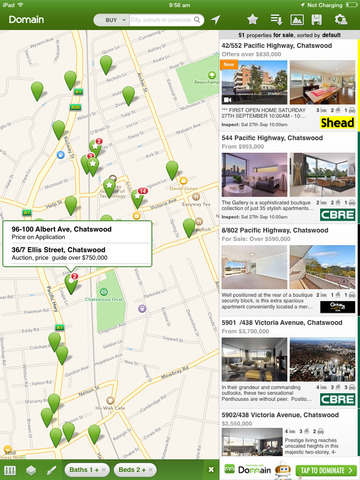 This particular app heads Australians' way from the Domain website, a fairly popular real estate website in the region, and is said to work as a complement to the mobile and desktop versions as opposed to a stand-alone operation. Essentially, the tool is designed to find where houses are available for sale in relation to the user's current location, and present that information to the wrist-mounted display. As it turns out, Domain had some history to draw on in constructing this app, as it had previously offered up Android smartwatch versions for the LG G Watch and the Samsung Gear Live back in August. Further reports suggest that it won't be alone in the field, either, as Realestate.com.au is also planning an app release for April 24, ensuring that Domain is going to have competition afoot right from go. Further app releases from other firms not particularly related to real estate are also poised to bring out some new apps, and several international apps—ranging from TripAdvisor to Shazam—will be ready to go on launch day as well, according to reports. Admittedly, there's only so much that can be done with smart watches; such devices largely depend on having a connection to smartphones or the like. But something like a real estate locator could actually be useful. Imagine being on a walking tour of a suburb and being able to tell just where the houses for sale are thanks to a small indicator on the wrist. That diagonal arrow shows to keep walking until it straightens out, then make a 90 degree turn and boom! Curb appeal ahoy! That's an idea that could make house-hunting in a narrow space a lot easier. But even when hunting in a wider field, it could still work out; while driving, having directions on the wrist could be an easy way to know where an upcoming turn is. Getting driving directions on a wrist might actually be easier than a dash-mounted display; looking at a wrist while driving does keep the eyes close to the windshield. Only time—and the reactions of users—will tell just how well Domain's app works out, but this combination of wearable technology and house hunting might just go together fairly well in the end.